This baby will not sleep apart from us for more than half an hour. He used to sleep in his crib for many hours at a time, but no more. This baby has not slept in his crib for more than a couple hours in more than a month, and most nights he sleeps most of the time with us. I have become a human pacifier. He does not know how to soothe himself. This seems to be something we cannot teach him. I intended to write here daily this month, but that did not come to pass. I do not believe in excuses, but by way of explanation, all we can do these days is try to get our children to sleep or back to sleep, or go to sleep with the baby. When that is not happening we are cleaning clothes and dishes or doing the basic stuff you have to do to live and work and parent. I do have a lot of things I want to write, but they remain trapped in my head, banging against the door trying to escape. I know the case of the baby who won’t sleep, nurses round the clock, or always wants to be held, is not new. This situation is more universal than unique. But that does not make it any less exhausting. Oy. Is There a Bird on My Head? Today I volunteered in Zoe’s first-grade classroom for the first time. Her teacher had asked if I would come in and read with kids. When I arrived, she handed me an index card with five kids’ names on it. I read about the life cycle of frogs, about goats (I learned there are more than 600 kinds), about how monsters make their meals (lots of metal junk), about Teeny Tiny Tina, about a tricky Grandpa, and about Elephant and Piggie dealing with a bird who makes himself at home on Elephant’s head. Zoe’s teacher has signs posted all over the room about how to read–strategies for sounding out words, techniques for reading with partners, questions to ask yourself to help you understand what you’re reading. I’d attended a reading celebration in the classroom already so I was familiar with the techniques. I’ve loved learning about how first grade works now because it seems completely different than it was in 1981 when I was in it. The options for reading with partners include choral reading (reading in unison), taking turns page by page, or echoing. With every book I read with every student, I asked how he or she wanted to read that one. 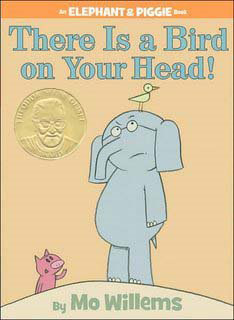 When L. and I were going to read There Is a Bird on Your Head he chose echoing. L. is a fairly fluent reader, and I thought echoing was really for kids who are still trying to sound out words, but it was his choice. And, although it took a long time, echo reading with him–especially that book–was fun. He read with enthusiasm and expression, and I echoed. I realized I could simply mirror his expression or interpret the lines (which are short) in a slightly different way with different inflection. I could see the benefit to echo reading for a young reader to hear another way of doing it even as he’s exploring his way. A few kids saw me carrying my card and wanted to know whose names were on it. One boy who is a friend of Zoe’s asked if I was going to read with him. When I said not today, he said he hoped I would read with him next time. As I was leaving, the teacher thanked me and said I was welcome to read with the kids anytime, and asked if I would be willing to read to them aloud–as if this would be a significant and daring feat to accomplish. I said yes. She also said she appreciated me coming in because some of the kids don’t have anyone to read with them at home. Somehow I was startled by this. I realize there’s a wide socioeconomic spectrum in Zoe’s class, and probably some parents work multiple jobs. But the idea that no one would be reading to these kids at home was heartbreaking to me. Zoe has probably spent thousands and thousands of hours reading and being read to over the past six years–by parents, grandparents, teachers, babysitters, and whoever else was willing. All this good book time has made her the reader she is today. Thinking that some of these kids don’t get to enjoy that time and attention at home makes me want to go back soon and read with all of them. By the end of the year I will know everything there is to know about goats. Is it jaywalking? Taking office supplies home (although who doesn’t take work home these days)? Eating food whose label says it’s expired? I am curious about what other people do that they’re not supposed to do. Whether it’s actually illegal, possibly unethical, a little immoral, or just against the rules. Whose rules are they anyway? I am a very strict rule follower. Most of the time. I realize we all make exceptions based on what is possible at the moment, or practical, or what we think really matters, or what we can get away with. Sometimes you have to turn left when the light turns red or you’ll never get to turn. Sometimes you eat it even when it’s been sitting out a little too long and hope that no one gets sick. Sometimes you say “no, he’s not available,” when you know your spouse does not want to take a short telephone survey. I guess that’s not a rule you’re breaking, but it is a lie, and technically we’re not supposed to lie, right? But then again, many people would argue that there are occasions where it is ok or even necessary to lie. I feel like there are so many times when I break the rules–even though I’m a habitual rule follower–that I wonder how other people approach rules? When you break them is it always accidental? Or are there some you just thing are silly and so don’t bother to follow them? Then I wonder how we teach our children when obedience to rules is critical and when it’s not. We don’t want them deciding on their own that following the teacher’s directions to stay in the classroom is optional. Or following our directions not to go into the street. So how do they learn to use their judgment? What rules are made to be broken? In the course of my work with the Navy-Marine Corps Relief Society, I have interviewed a number of active-duty and retired Sailors and Marines. I have also talked with many military wives about how they held it together when their spouses were serving, either at home or deployed. And I have talked with Navy-Marine Corps Relief Society visiting nurses who make housecalls to help military families with regular (but still stressful) things like new babies, or with extraordinary circumstances, like combat-injured veterans who have to come home and, with their families, try to create a completely new life. I’ve also talked with Society staff members and volunteers who work with all of these folks every day, to help them when they need help. And I am in awe of all of them. My family is not military (although my dad always talks about his reserve duties, they were brief and uneventful and took place stateside) and until my conversations on behalf of the Society, I had little insight into the struggles and sacrifices of these tough men, women, and kids, except what I saw on the news. So today, on Veterans Day, I am thankful for those who have steadfastly served our country, and for all those who support them–as spouses, as kids, as doctors and nurses, as volunteers, and as anyone who does whatever it takes to help. I salute you all. This is always worth reading again. We need a new vocabulary to talk about babies. It makes me crazy that people talk about babies being good or bad, and it’s not as if people are making character judgments, but that’s just what we say, and it makes no sense. It’s just luck. When I brought Zeke to Zoe’s school recently for a reading celebration, a teacher said, “he’s so well-behaved!” as if I had trained him or he had chosen to be especially quiet and cute during the activity. Totally luck. The answer is no. He does not sleep well. He sleeps very lightly and, although he slept through the night for a glorious three weeks this summer, he has not done so since. I cannot get him to nap, although others can, unless I drive him to the airport. He wakes himself up a lot. And therefore wakes us up a lot. But this is just a fact. It has nothing to do with Zeke’s intellect or spirit or soul or character in any way. From what I understand, many babies do not sleep well. It’s a well-known characteristic of babies. They are often awake. Of course it is paradoxical that I want to take pride in things that are going well with Zeke’s development, all of which are equally unrelated to merit. For example, he loves to eat and he has eaten all kinds of food (all pureed of course, except for those little puffs which he grabs and desperately tries to put in his mouth but they just adhere to his palm with slobber and I have to pry them off and place them on his lips). Since I’ve discovered these awesome little pouches of baby food, he’s eaten spinach and pumpkin and lentils and blueberries and quinoa and eggplant in addition to the usual babyfood suspects. He devours ALL OF IT with relish. (No, we don’t serve him relish). And I am thankful for his appetite and that so far he hasn’t been allergic to anything. He exercises his abs with vigor. He really wants to sit up. He can sit up supported pretty well and unsupported for about a second. He’s really working on it. He can also scoot and rotate pretty well. I remember Zoe doing this too. It’s kind of amazing to not be able to crawl but somehow move yourself from one location to another in the crib or on the floor. Zeke is talkative. He babbles in a way that sometimes sounds startlingly like words. He loves it when you imitate what he says, and he enjoys his sister repeating words such as splash and spleen over and over in different tones of voice. We are determined to sign with him, and so far we’ve mostly done milk. But I think he recognizes it. When I sign milk he divebombs my shirt. We’re working on the signs for more and all done. If nothing else, he smiles at the sign for all done. We’re also working on high fiving. Why this is an important first trick for babies, I’m not sure, but it’s fun to tackle. Zeke is big. At his six-month checkup yesterday the nurse exclaimed, “he’s as big as some two-year-olds!” Whoa. I’m not sure about that, but he’s a substantive fellow. And a wiggly one. It is increasingly difficult to change his diaper because he wants to revolve while you’re doing it. He likes to tap, pat, whack, and smack things. Especially wood and hard surfaces. Also people. He also likes to chew on everything. I bought a teething bling necklace to keep his mouth entertained and protect my jewelry, and Zeke loves it. Zeke adores his sister, and she him. His face lights up when hers comes into view. Thank goodness she is kind to him and entertains him sometimes and wants to hold him. She’s still not quite coordinated enough to hold him without us holding our breaths, but we’re all working on that. At one of his post-op appointments, he smiled at the nurse who was taking his vitals and took hold of her finger in an unusually gentle and inquisitive way. She was charmed and told me how special he was. Of course, we think so, but it’s always flattering to hear someone else say so too. That’s a word I appreciate. A couple days ago I wrote a post about feeling sensitive to an offhand remark by a neighbor. A lot of people read this and many commented on it and some misinterpreted what I wrote, so I felt like a jerk, and frustrated that as a writer, I had not articulated my thoughts more clearly. So I took the post and the Facebook discussion down because I don’t like conflict and I didn’t feel like defending myself in what can be a very clumsy medium for discussion. I keep thinking about why I write this blog in the first place. What makes me think people want to read about what I’m feeling? The explosion of blogs seems to indicate many people think their thoughts are worth sharing. And someone must be reading these things. Or maybe not. Are we writing to write or to be read? When you put something out there for the world to read, you can’t expect everyone to like it. You can’t take the response personally. But you still do. I have never developed a thick skin. I certainly invite and accept constructive criticism about my professional writing, and am always better for it. Every writer needs an editor. But when you write something on a blog and people comment, it’s like they’re commenting on your heart. At the risk of overquoting, I was relieved to read Momastery today: http://momastery.com/blog/2013/11/07/idea-title-im-even-sure-read-nets-well-call-nets/, in which Glennon talks about feeling nearly skinless. Perhaps exacerbated by my chronic sleep deprivation, I so relate to this feeling of tenderness and fragility. Maybe it’s also related to being a mom, especially a mom of an infant who is so vulnerable and dependent on me and who just had surgery for pete’s sake. How could that not make anyone feel a little emotionally wobbly? So I’m getting back on the saddle. I’m going to try to think of what truths to tell that matter and I will take deep breaths when people respond with their own. As Glennon says, “WE CAN DO HARD THINGS.” I am already doing many hard things. What’s one more? And then there was the time that I was putting Zeke to bed and the only way to settle him down was to lie down on the guest bed and nurse him. And when he fell asleep, I fell asleep. And then Randy came in to check on us and he moved sleeping Zeke to his crib. And moments later, Zeke awoke. So I brought him into our bedroom to lie down and nurse with him. And we fell asleep again. And then suddenly it was almost midnight. And I didn’t go to Zumba or finish laundry or put away the leftovers or anything else. But I slept. And Zeke slept. And that was tonight. My complicated relationship with religion and church began before I was born, with my grandparents’ religious beliefs and practices and their effects on my parents’ upbringing and particularly on beginning of their marriage, which were significant. Fodder aplenty for another post. My adolescent inclination toward the protestant church was prompted primarily by the comfort of visiting my Nana and Papa’s church and not at all related to Jesus. Years later, my retreat from being Presbyterian (where I even became an elder at a tender young age) was caused mostly by eminently reasonable questions that my husband asked me when we were attending church together and he was considering joining. Still more years later, I am Unitarian. He is Unitarian. We belong to a spectacularly vibrant church whose philosophy and message and work in the community and world we absolutely embrace, where we are challenged and engaged by the sermons and consistently moved by the music. And yet. This is a church of 1,300 members. We have, on more than one occasion, fallen through the cracks. It can be hard to find community in such a large congregation, although there are opportunities. When you’re young and single, as I was when I joined the Presbyterian church where I used to be a member and where we were married, it’s easy to get involved. Back then I could volunteer, serve on committees, attend everything. I made friends who I still count as some of my closest friends. When you join a church when you’re married, then have a kid, then have two, and you live in a different city than where the church is located, it’s harder to put yourself out there, even though you know that’s what you would really need to do to feel a part of things. After belonging to our church for a couple years, a few things happened that caused us to take some time off. Human frailty things. I get that the church is made of humans and humans make mistakes (even me!) and that’s just the way it is. But when you’re seeking sanctuary and comfort and think of church as a safe haven from the rough world, and bad things happen at church, it can still be hard to take. It’s easy to confuse the people with the church. (This happened to me before when I learned in college that a pastor [married with kids, for whom I babysat] who had been a role model for me as a teenager–who baptized and confirmed me–repeatedly sexually harassed women who he was supposed to be counseling, as well as the associate pastor with whom I was very close. This shook me deeply and I stopped going to church for a long time, as if somehow he was church). So we’re back at church now. We’ve made a few more friends. It’s still pretty difficult to get involved. I often still feel like we’re falling through the cracks. Zeke is scheduled to be dedicated at church in a few weeks. We have family and friends coming. The minister who’s preaching is not one of the ones we’re friendly with. I’ve only ever had a couple awkward conversations with her. The other pastor leading the service that day is someone who I do like, and with whom we have a nascent connection. She has a young daughter and she always wants to hold Zeke and chat with Zoe when she sees us. We’ve requested that she do the dedication. I hope this actually happens. I think it will be more meaningful, and maybe it will ease the unpleasant memory of Zoe’s dedication, which was performed by the unknown intern minister, a total surprise to us, who smelled of smoke and mispronounced our name. I’m sure it’s hard to connect with every congregant when there are 1,300 of them. It’s no wonder we don’t see the same people in the pews every week. To be fair, a family from church who I think we’d only met once and really knew only from a listserv did bring us a lovely meal after Zeke’s surgery. Another family with whom we shared a dinner ordered delicious Thai delivery another night. So there are connections to be deepened. And there’s so much to be learned and to be inspired by there. I just want to seal up some of those cracks so we don’t fall through as often. Sometimes I feel bad that we don’t do more, or join more, or participate more. But we show up and we listen and we sing and we bring our kids and Zoe loves the music like we do and sometimes people we’ve never met before come up to us after the service and say they enjoyed watching us or watching Zoe and Zeke be part of the service. And really, showing up is all we can manage right now. So just showing up must be enough.